Day 87 was hot and humid, and a little less overcast. I said goodbye to US 90 today. I will be on more back roads until I reach Gainesville. Route US 90 was good to me. It provided smooth pavement and good shoulders. I could have taken it a bit further but opted to stay on the Adventure Cycle map routes. The route from here in not very direct. I will travel from Madison through Gainesville then to Saint Augustine. I figure I have 5 to 7 more riding days and likely at least two more rest days along the way. Weather and body permitting I am tentatively planning to arrive in Anastaisa State Park on Tuesday October 29th. I have seen more dead snakes along the roads in Florida than all the other states combined. Today I saw a dead rattle snake. I was tempted to stop and cut off the rattle but I would have had to use my teeth and I wasn’t hungry because I just ate lunch. I did see a black and red striped snake I think was a mud snake. Looks like rain on Tuesday 10/22 so I think I will take the day off. Moss may not grow on a rolling stone but you know you are moving slowly when fungus starts growing on you. This may also shed some “dark” on why my solar panels are having difficulty keeping up with my electrical needs in the sunshine state. Fungus but no Moss yet. Day 87 Stats: I rode 40.2miles at 12.3 mph, Max=17.6 mph, Calories=1065, Ave heart rate=109, Max heart rate=139, Ascent=703’, Descent=689’, Max elevation=175′, Min elevation=64′, Temp= 75 dgr., Riding time= 3:16, out of 3:56, Total trip miles=2781. 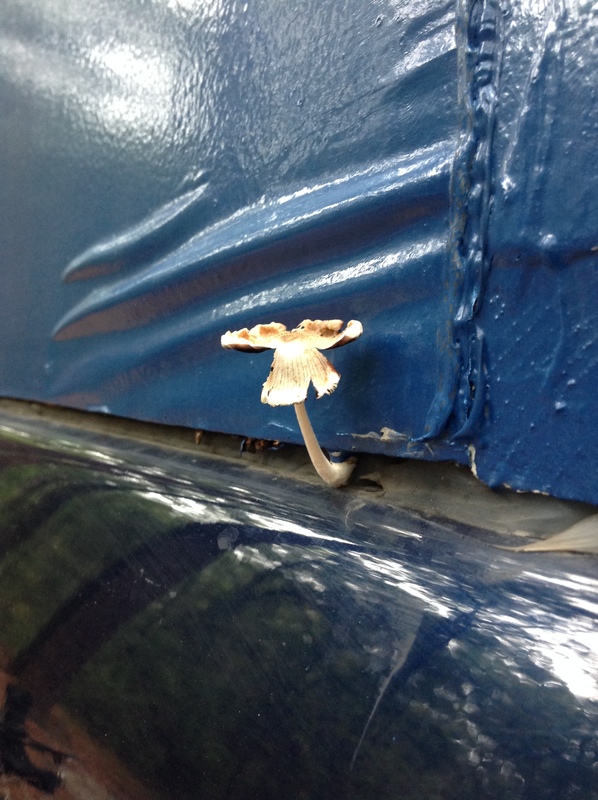 That is exactly where the mushroom sprouted. Ummm Louisianna? Maybe that’s why our gas mileage isn’t so good.